The word was out, gold had been found near the confluence of Cherry Creek and the South Platte River – near the center of present day Denver, Colorado. The rush was on to head to the hills in search of wealth producing veins of the precious metal. "Pikes Peak or Bust" became the rallying cry for prospectors with a serious case of gold fever. Now through August 2009 an exhibit along the walkway to conco urse A at Denver International Airport commemorates the sesquicentennial of the Colorado Gold Rush. Books and maps show supply lists and routes followed by hopeful emigrants. Letters and diaries detail successes and failures, longing and love, sorrow and humor. Photographs record changes in the land and the men and women who gave birth to Denver and Colorado. The exhibition is located between the main terminal and concourse A, before the security screening area, making it accessible for everyone visiting the airport. 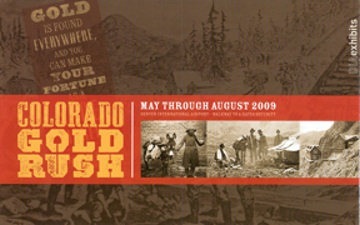 Passing through Denver, seeing someone off or picking up an arriving passenger at DIA, take time to discover the story of Colorado’s Gold Rush.